Whatever the style or design criteria for the home, at its core is the wall framing. 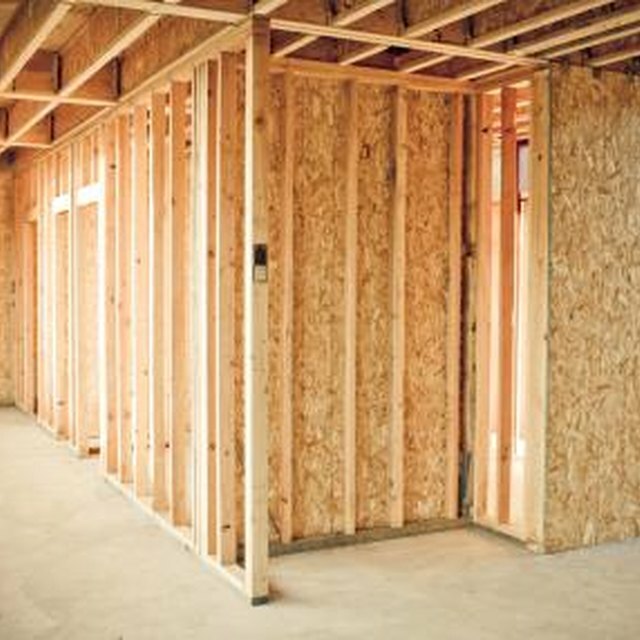 The most common element of wood frame construction is the stud wall. The basic procedure for framing a standard 2-by-4 stud wall can be adapted to a wall of any length, and it's a task most do-it-yourselfers can handle. Measure and cut two lengths of 2-by-4 framing lumber to the desired length of the wall section to be built, using a tape measure and circular saw. These will be the top plate and sill plate of the wall section. Place the two plate boards cut on edge, on a flat surface. Make the ends flush with each other. Hook the end of a tape measure on the flushed ends of the two 2-by-4s and mark the first stud layout line at 15¼ inches with a pencil, then mark an X on the side of the measured line away from the end being measured from. This designates the side of the layout line on which the stud is to be placed. Use a hand square to extend this line across both boards. Begin at the first stud layout line marked in Step 2 and measure the remaining wall stud layout at 16-inch increments for the full wall length of both plates, including the X to designate the stud placement. Use a hand square to extend each layout line across both plate pieces. Separate the top plate and sill plate laid out in Steps 2 and 3 parallel and far enough apart to place full length wall studs between and perpendicular to the plates. Keep the plates positioned upright on their sides. Spread out standard 92¼-inch precut wall studs between the plates positioned in Step 4, placing one stud on edge at each layout line marked on the plates. Also place one standard stud at each end of the plates to complete the wall section. Place the end of the first stud against the sill plate, making sure to keep it on the X side of the layout mark, and attach the stud to the plate with a hammer and two 6d nails through the plate into the end of the stud. Keep the side of the stud aligned with the layout line to keep the studs square to the plate. Repeat Step 6 for each stud in the wall section, including the end studs. Go to the top plate side of the wall section and repeat Step 6 for each wall stud. Cut a length of 2-by-4 lumber to the length of the top plate for the second top plate required to complete the wall, using the circular saw. Attach the second top plate layer to the top plate installed in Step 9 with a hammer and 16d nails space approximately 12 to 16 inches apart. The wall section is now ready to stand and position in place. It is standard practice to include the location of any doors or windows to be included in the wall at the time of layout to ensure the full-length wall studs are omitted and the specific framing for those elements is accurately positioned. Framed stud walls connect to each other with the second top plate, by either extending onto the adjoining wall or allowing space for adjoining wall's second top plate to extend onto it. Create a notch at the second top plate by deducting 3½ inches from the second top plate's length where the joining wall meets it. Evaluate the top plate connections to adjacent walls during layout.